On Wednesday, Ralph and I had to run a few errands in spite of the fact that we both felt like just sleeping all day. I’m sick of this sickness and it needs to go away. I didn’t come here to whine so let me show you the fun part of the errands we had to do. What had started out looking like rain when we left home, in a short time morphed into this. Autumn in the snow. At our second stop I saw this. 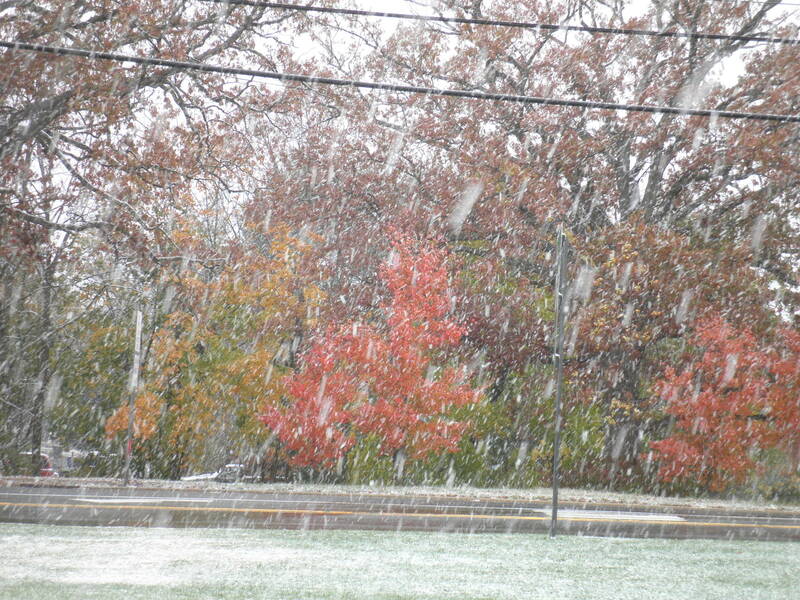 Some Fall color still holding on and looking quite beautiful in the snow. By the time we got home we were back to just rain again. We stocked up, like everyone else at the neighborhood store. We wanted to be ready for when the storm got to us. Well of course it didn’t get to us and yet we were stocked up. Ah well. We should not complain considering how lucky we’ve been with the last few storms. I love it! I’m going to go make a magic potion to try to get well. The snow fall is sooo pretty. 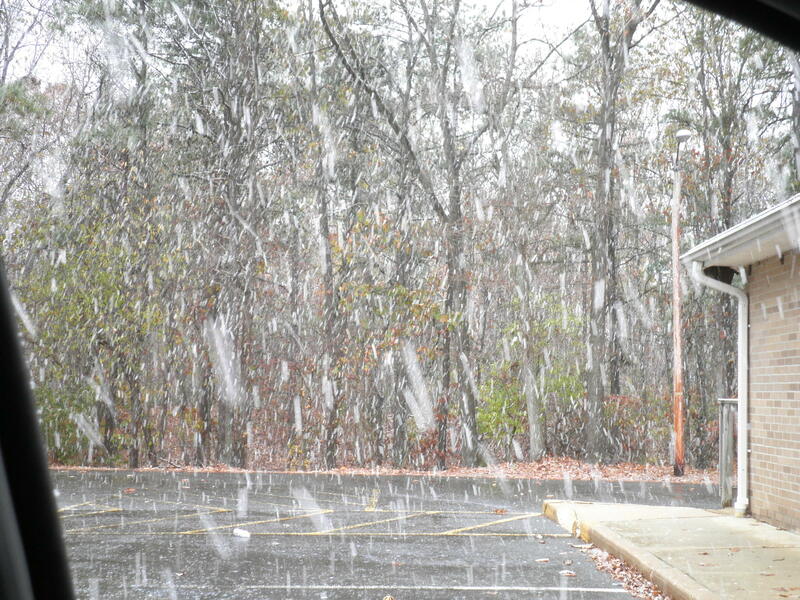 I can’t wait for it to snow here…we got flurries yesterday but I missed them because I was working. Hi Dawn! This was in a different area than where we live. We drove through it and came back to rain. I don’t mind a bit to make things look pretty, but I’m not up for too much, yet! Have a great day! ah, that snoopy cartoon is too cute! thanks for sharing, fran (and ele!). eesh, i am sorry for all that snow you rec’d. yup, it’s TOO EARLY for white stuff!!! take care of your cold, and i hope you feel better as the day goes on!! Thanks, Cathy! I keep trying! Have a great day! 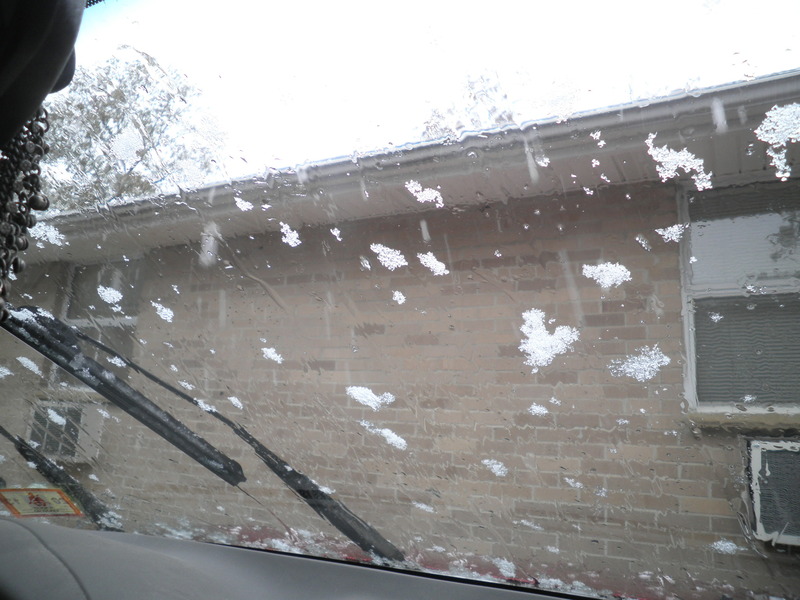 I saw a couple of snow flakes yesterday but that was all! Hope you are feeling better soon. Thanks, Suzi…I’m doing everything I can to get better really soon! Snow! I like that I can enjoy your snow, and not have to experience it ;D I hope you’re feeling better! And colds just call for lots of comforting food, it’s the rule of being sick! Pretty snow! It’s just cold here. Boo. I swear that matzo ball soup is the cure for all. Feel better soon! Laura, luckily it didn’t stick around for long. I’m trying everything to get rid of this. Yuck! I love Snoopy! 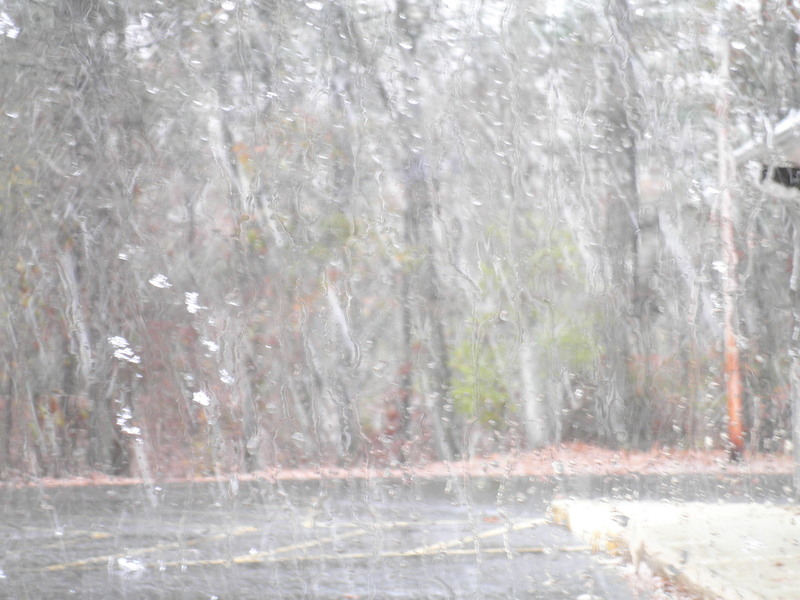 I DON’T love snow though and am glad it turned into rain, hoping we don’t get any of that this year! Eleanor, it may be pretty, but I could easily do without snow. Isn’t the Snoopy adorable? I’m trying to get better as quickly as possible! Thanks and take care.